The United States Congress designated the Cecil D. Andrus-White Clouds Wilderness (map) in 2015 and it now has a total of 90,775 acres. All of this wilderness is located in Idaho and is managed by the Bureau of Land Management and the Forest Service. To the west stretches the Sawtooth Valley where the jagged peaks of the Sawtooth Wilderness form the skyline. Across the Salmon River to the north lies the iconic Frank Church-River of No Return Wilderness and the Middle Fork of the Salmon River. Named by early settlers for soaring white peaks that rise to join the clouds, these mountains are hidden treasures in a land of wild places. Here you'll find quiet solitude surrounded by magical scenery, abundant wildlife and whitebark pines, some of the oldest trees on earth. A variety of rock types make up these mountains, with many of the namesake peaks being composed of a kind of metamorphosed limestone. The alabaster pyramid of D.O. Lee Peak is one of the most distinguishable summits within the White Clouds, and the entire wilderness was renamed in 2018 to recognize former Idaho Governor and Secretary of the Interior Cecil D. Andrus. Also common in the area is granite from the Idaho Batholith along with Challis volcanic found at lower elevations in the eastern and southern portions of the range. The result of all this is dazzling mountains whose color appears to change with the weather and time of day. Dominating the multi-hued peaks, the tallest mountain in the White Clouds (and the entire Sawtooth National Recreation Area) is Castle Peak, an Idaho icon at 11,815 feet, whose massive summit towers hundreds feet above all other peaks in the area. It was here that a proposed open-pit molybdenum mine set off one of Idaho's fiercest conservation battles, leading to the designation of the Sawtooth National Recreation Area. 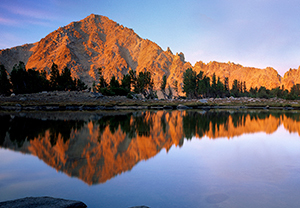 Hidden amongst these peaks and surrounded by wildflower meadows lie many of the highest elevation lakes in Idaho. Numerous lakes are accessible by the 57 miles of trail that crisscross the wilderness while other alpine gems challenge visitors with off-trail navigation skills. The clear, cold waters originating from these pristine watersheds feed the Salmon River, comprising the highest-altitude spawning grounds for salmon and steelhead in the continental U.S. and a crucial habitat for bull trout and other species. The area has been an important part of the West's pioneer and Native American history. And today recreationists--horseback riders, hikers, campers, skiers--find opportunities to explore rugged landscapes that are beyond compare. Of course, wilderness doesn't only provide refuge for people. It also contains delicately-balanced habitat for wildlife including bighorn sheep, mountain goats, moose, elk, mule deer, black bear, pronghorn, gray wolves, mountain lions and elusive wolverines. Because of the diversity of wildlife and its wild character, the wilderness is also a treasured destination for hunters, fisherman, and wildlife watchers. Planning to Visit the Cecil D. Andrus-White Clouds Wilderness? How to follow the seven standard Leave No Trace principles differs in different parts of the country (desert vs. Rocky Mountains). Click on any of the principles listed below to learn more about how they apply in the Cecil D. Andrus-White Clouds Wilderness.